Let your dreams fly like a hummingbird.. EXCLUSIVE & UNIQUE SQUARE STRAINERS! 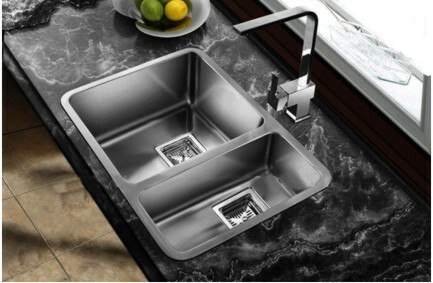 Castle Bay offers anti-scratch true colored stainless steel sinks. 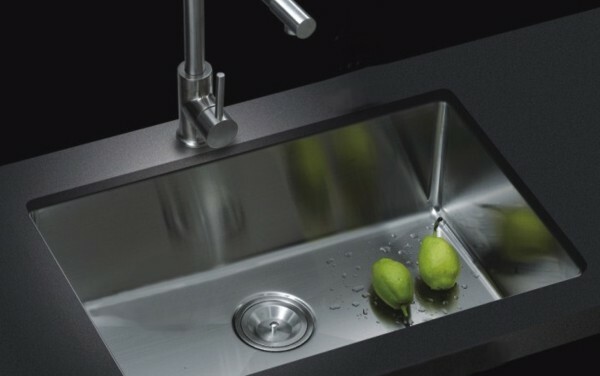 Black kitchen sinks -first of its kind in Canada. COMIN SOON! Bossino is a subsidiary brand of Castle Bay Sinks. Add a splash of color to your kitchen. Available in gold black matte finishes. Homeowners in search of the best filtered drinking water should head for the BlueFresh Pro System. Welcome to the most affordable, quality stainless steel sinks and faucets offered in North America. 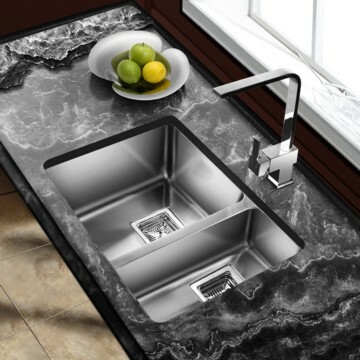 When it comes to high quality and affordable stainless steel sink, Castle Bay is the name that is trusted by consumers, contractors, and designers for uncompromising craftsmanship and performance. Castle Bay stainless steel sinks including our undermount sinks are manufactured with high quality, durability, and style in mind. With many years of experience in the kitchen sink technology, Castle Bay offers the ultimate in quality and craftsmanship. 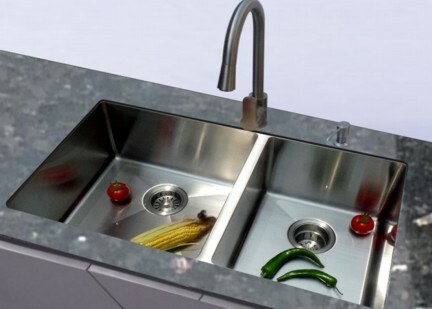 All our stainless steel sinks are made to last a lifetime. Our kitchen undermount sinks bring comfort and value to your home at an affordable price. "Value for life" is our mission. Our extensive kitchen sinks line includes the premium handcrafted 90 degree Legendary Series and radius corner Canon Series, and a wide range of classic style Classic Series undermount sinks to suit various home applications. For compact space, check out our Madison series which offer the design and look for the modern condominium market where space is tight. From evolution to revolution. The Castle Bay Legendary and Lincoln Series have already capturing the attention of the designers across Canada. The innovative and bold design of the Diamond Series is just the beginning of Castle Bay's revolution for change and better performance. With the properties of being hard and strong, our Diamond Series sinks are made to last a lifetime. Click here to read more about our sinks. Castle Bay is the pioneer of stainless steel sinks and faucets. Our kitchen faucets are made of SUS 304 (American ASTM standard) stainless steel material which is durable, higher performance, superior than traditional faucets made by brass. 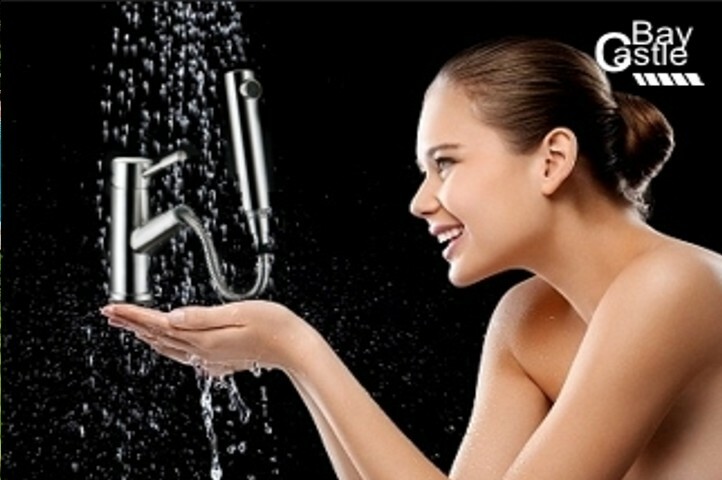 Stainless steel faucets provide the ultimate in natural beauty and robust durability. Corrosion of brass can contain harmful substance such as lead, zinc, chromium and other substances. The United States Environmental Protection Agency (EPA), still estimates that as much as "20 percent of human exposure to lead may come from lead in drinking water." It's time to finally draw the line - no more lead in our drinking water faucets! Castle Bay faucets are lead free.On a larger scale, Castle Bay stainless steel taps deliver safe, healthy water for drinking and cooking and are compliant with the new USA Federal Lead-Free Legislation which becomes effective January 2014, in addition to the existing NSF-61. Castle Bay is committed to provide healthy and smart choice to consumers by investing into a more expensive but superior technology. Castle Bay taps are designed for durability, beauty, and performance. Our kitchen stainless steel faucet collection offers the latest features for ease of maintenance and durability while offering great styling and complementing our undermount sinks. Protects the environment, starts with you and me. Water is an important natural resource. It is vital to our life. Water is the connecting link of all ecosystems for the survival of mankind. With the growing awareness of environmental protection, healthy water is the choice for modern age. 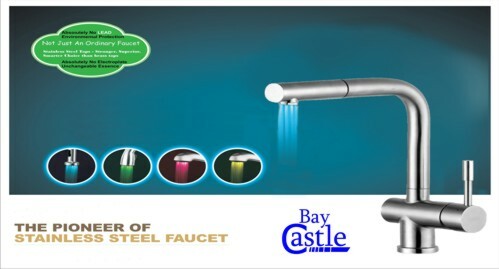 Castle Bay faucets are made of 100% solid stainless steel which is 100% lead free, healthy and recyclable. We are committed to creating greener products and high quality designs that help reduce environmental impact. Find out how Castle Bay is designing products that fit your life, while being mindful of the environment. Waking Up to the Dangers of Lead? In USA going "green" isn't just a trend...it's a responsibility! Now, it's the LAW! Beginning January 2014, USA Federal Law will require ALL faucets be replaced with 'Lead-Free' compliant products. A wake-up call was sent to all Americans when President Obama signed legislation mandating that all plumbing fixtures and faucets that dispense drinking water be replaced with lead-free compliant prdoucts effective January 4 of 2014. While this will affect the entire United States, most of the public has been uneducated about the dangerous effects of lead in drinking water, and what, if anything, they can do about it. Fortunately, we at Castle Bay have been proactively one step of the headlines, and we're proud to be the pioneer of stainless steel construction faucets, and leading the way to a greener and leadfree environment. Click here to learn more about how the new lead-free legislation affects you. Click here to read more about our lead-free faucets. What's News, Features, and More. Our company's tradition is defined by constant innovation. Castle Bay's commitment to excellence means that we are continually enhancing our product lines to bring you the newest technologies and features available in the marketplace. Every year Castle Bay introduces the newest innovative products to customers across Canada. 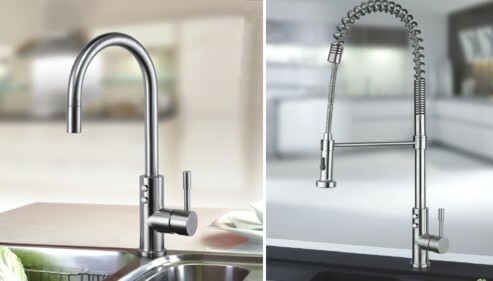 This year, at design shows in Toronto and Vancouver, we unveiled three major breakthroughs - FilterWater Faucet, the LED Faucet and the new generation linkage Faucet. 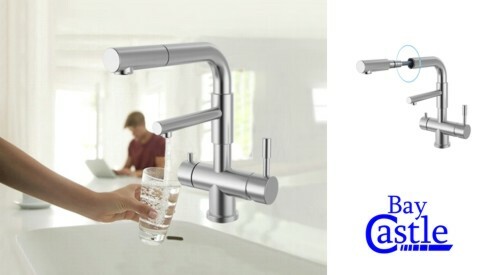 FilterWater Faucet: Enjoy fresh filtered drinking water directly from a kitchen tap. Designed with a water filter built directly into the body, drinking faucets are specially created for one purpose - to produce cold, filtered water on demand. LED faucet: Turn on the water and watch in amazement as it changes color according to the water temperature. Press and Drain: One of the smartest revolution in faucet technology in more than a decade. You simply press the button on the faucet, and it will drain away the water. Really easy! With a reputation for innovation and craftsmanship, we continue to create stunning designs, making beautiful and practical products that re-invent the kitchen as a place to work - and a work of art. Our distributors are located across Canada. Serving Toronto, Mississauga, Oakville, Brampton, Ajax, Pickering, Hamilton, Ottawa, Montreal, Kingston, Barrie, London, Orangeville, Calgary, Edmonton, Halifax, Moncton, Fredericton, Charlottetown, Vancouver, Victoria, and other cities close to you. 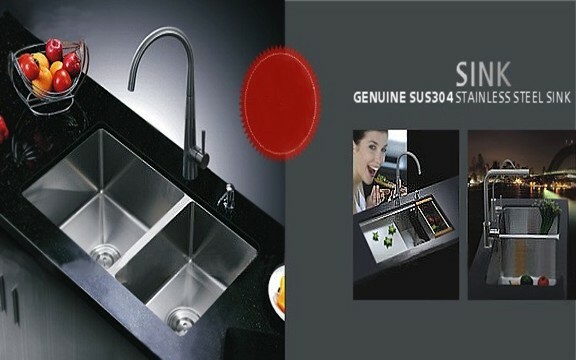 Black Gold Kitchen Stainless Sinks - NEW! Water is life. Yet nearly 900 million people do not have accessed to clean water ..
Water is life. Yet nearly 900 million people do not have access to safe, clean drinking water, and 2.6 billion people live without proper sanitation. Water For Life . Help UNICEF. Water is life. Water-borne illness is the second-highest cause of childhood death in the world. When water is unsafe and sanitation non-existent, water can kill. Castle Bay is fundraising 50 cent event for UNICEF Canada to show our support for the thousands of children that have to walk long distances every day to collect water for their families. Just $1 can provide a child with safe drinking water for 40 days. Every day, more than 5,000 children die of water-related diseases. Nearly 900 million people worldwide lack access to safe drinking water. Watch in amazement as the water changes color according to the temperature. It's time for Castle Bay to complete your modern kitchen faucet with illuminated LED lights that will change depend on what temperature the water is. A forward-looking design, the Castle Bay Lighted faucet incorporates a fun, yet practical, LED light that does not require an electrical connection! Powered by a turbine, the coloured LED light displays a red light for hot water, blue for cold and yellow or green for a mixed temperature. This innovative use of technology is sure to fascinate your family and guests alike. Time is becoming increasingly important in our fast-moving world. The new InstantRed Kettle faucet has now put an end to all that waiting for boiling water. 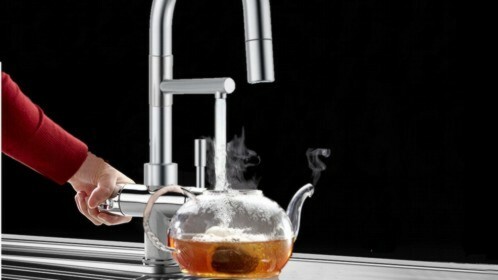 They dispense boiling hot water at the touch of a tap to make fresh tea, coffee or other hot drinks- instantly. InstantRed Kettle faucet system consists of just a fitting device which can be installed unobtrusively and compactly under any standard sink, making water boilers and kettles a thing of the past. 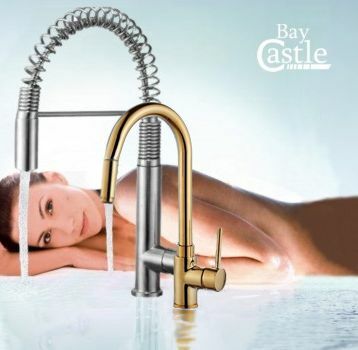 The acquisition of Bossino perfectly fits within Castle Bay's strategy of broadening the company's market position beyond plumbing products to include kitchen appliances, strengthening the company's existing collaboration capabilities. 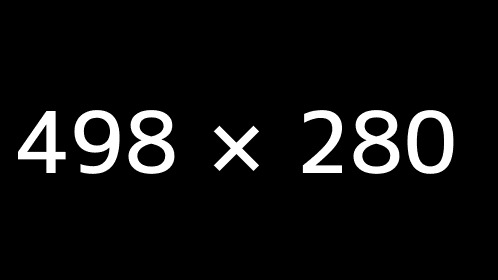 We are living in a very complex world. Sense and simplicity is important to us. We believe that technology should be simple and functional to make our lives less complex. The kitchen hood ensures comfort and well-being in the kitchen, the place of culinary exploration and stimulus for the senses. The range hood breathes life into the kitchen. We are seeking to reduce the carbon footprint, and to enhance our well-being through unique appliances. 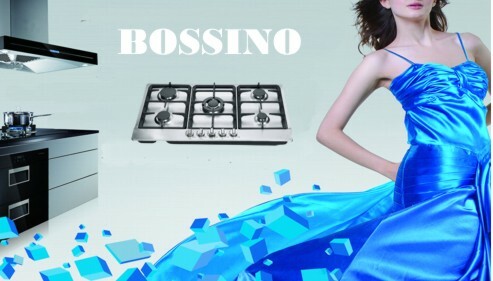 Thanks to Bossino's outstandingly low noise levels, powerful extraction and innovative technological solutions, you can cook and have a show to impress your family and friends. When creating a dream kitchen, there's one common truth: no one dreams alike. Fortunately, Bossino offers a full line of range hood solutions to meet almost any kitchen ventilation need your home might have. It's your kitchen. It's your taste. 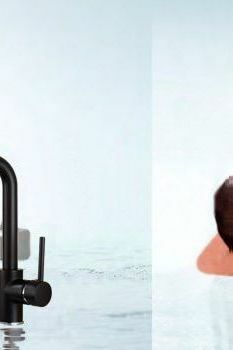 Enjoy fresh drinking water directly from a kitchen tap. Today. Designed with a water filter built directly into the body, drinking faucets are specially created for one purpose - to produce cold, filtered drinking water on demand. A separate undercounter water filter system is required. The perfect harmonization of minimalist style and maximum performance makes our Pyke Series truely innovative. The unique square strainer style has captured designer's attention across North America. The unique BlueFresh system delivers fresh, great-tasting filtered water.. 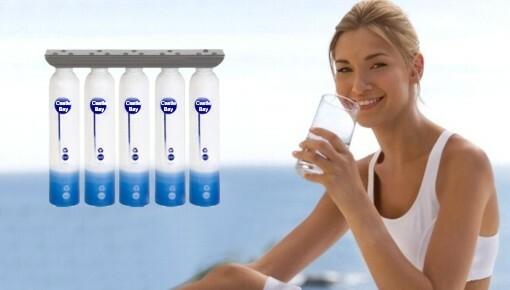 The unique Castle Bay BlueFresh Filter System delivers fresh, great-tasting filtered water with 5 stages of purification. From removing chlorine and taste, odour to reducing chemical contaminants, to bacteria and viruses, BlueFresh has the solution for you. Using highest quality material requires a profound emphasis on superb craftsmanship. Highly skilled artisans and craftsmen complete a series of intricate procedures culminating in a finished product held to be the highest standard of artistic detailing and exacting craftsmanship. One of the smartest revolution in faucet design in more than a decade. The Castle Bay Linkage Switch Drainage faucet is already capturing the attention of designers across Canada and United States. You simply press the button on the faucet, and it will drain away the water in the sink. Really easy! Stay tuned for the launching! The InstantRed Kettle faucet dispenses boiling hot water at the touch of a tap to make fresh tea or coffee - instantly. The Lighted Faucet redefines kitchen as luxurious space extending the invitation to spend more time and to enjoy. With intriguing ideas, innovative design and sophisticated technology, castle Bay brings a new vision to the kitchen. The 5-in-1 InstantRed Filter System with integrated faucet offers HOT & COLD filtered water from the same tap. Designed with a water filter directly into the body, drinking faucets are created to produce cold filtered water on demand. A combination of toughened safety glass and stainless steel bowls - the newest elegant design in 2013. No more getting your sleeves wet. Simply press the button on the faucet and watch the water drains away. Enjoy cleaner, healthier, great-tasting water at a fraction of the cost of bottled water. Environmental Friendly. 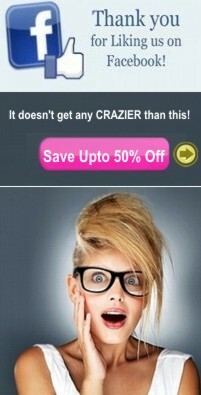 It doesn't get any CRAZIER than this. Make sure to check out Castle Bay's promotional offer! Participating Dealers Only. 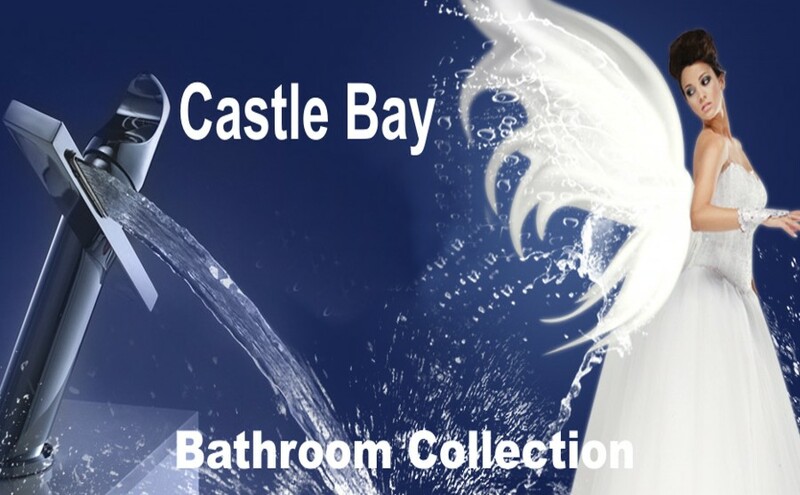 We at Castle Bay try hard to deliver the absolute best and luxurious products at an affordable price to you. From time to time, we will offer limited time promotional sale across NOrth America. Ask us about the limited time offer at participating dealers. Some dealers may also choose not to participate in the promotion. 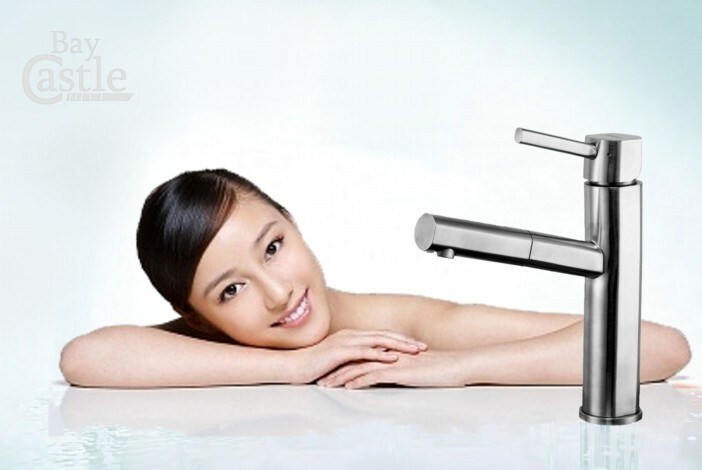 "Melrose is a fabulous and stylish faucet for a very reasonable price. The body feels so solid...i love CB, it really is Value for life!!" "The Giordano's "high arc gooseneck" allows for more options. You can clean large pots and pans with ease and also allows you to fill a large pot sitting in the sink. The pulldown spayer extends the options for filling or spraying to clean the sink.!" Very nice! Serving including Canada throughout Agincourt, Ajax, Aurora, Barrie, Belleville, Bracebridge, Brampton, Brantford, Bridgewater, Brockville, Burlington, Burnaby, Calgary, Cambridge, Charlesbourg, Charlottetown, Chatham, Cobourg, Collingwood, Concord, Edmonton, Etobicoke, St.John, Fredericton, Georgetown, Guelph, Halifax, Hamilton, Kentville, Kingston, Kitchener, Lafontaine, Langford, Langley, Laval, Leamington, Lethbridge, Lindsay, London, Markham, Milton, Mississauga, Montreal, Newmarket, Niagara Falls, North Bay, North York, Oakville, Orangeville, Orillia, Oshawa, Ottawa, Owen Sound, Parksville, Parry Sound, Pembroke, Penticton, Peterborough, Port Coquitlam, Port Elgin, Quebec City, Quesnel, Regina, Rexdale, Richmond Hill, Saint John, Sarnia, Saskatoon, Sault Ste. Marie, Scarborough, Sherbrooke, Sherwood Park, St. Albert, St. Catherines, St. John's, St. Laurent, Stratford, Sudbury, Surrey, Thunder Bay, Timmins, Toronto, Vancouver, Vaughan, Victoria, Victoriaville, Virgil, Wallaceburg, Wasaga Beach, Waterloo, Welland, Whistler, Windsor, Winnipeg, Woodbridge, Woodstock, and Yorkton. North America, Canada, Unite States, Atlanta, Orlando, New York, New York City, NYC, New Jersey, Miami Florida, San Francisco, Sacramento, Las Vegas, Ohio, Chicago, Boston, Houston, Texas, Los Angeles, Salt Lake City, Minneapolis, Dallas, Washington, Seattle, Austin, Nashville, Buffalo, Denver.